MorphVOX Mac will change your voice online and in-game on your Macintosh® computer. Take your voice-changing to a new level with superior voice-learning technology, background cancellation, and sound quality. Download voice and sound packs adding many new voices and sounds to MorphVOX. Tweak each of these voices to your heart's content to produce even more voice combinations. Download free voice and sound packs adding many new voices and sounds to MorphVOX Mac. Tweak each of these voices to your heart's content to produce even more voice combinations. Try out the "Backgrounds" feature which lets you add any background sound while you talk. Fool your friends: sound like you're in the middle of a traffic jam or shopping at the mall. Superb voice changing algorithms and ultra-quiet background cancellation make it one of the cleanest-sounding voice changers available on the market. Its high-quality sound is perfect for creating voice-overs for your latest video or audio project. Optimized for online games. Use it for changing your voice to role-play and add fun to online games. Sound like the character you play in-game whether you choose to be a grumpy dwarf or a mighty giant. 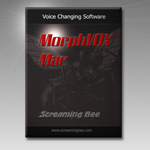 MorphVOX Mac voice changing software is fully functional for a free 7 day trial. After the trial just buy and use, no subscriptions.